Keith Schaefer, publisher of Oil & Gas Investments Bulletin, profiles a small-cap oil and gas firm active in the Oklahoma STACK that he believes stands out from the pack. Oil stocks will be a screaming buy sometime between now and Dec. 31. Tax loss selling pressure will add to the pressure of lower oil prices, and some crescendo of selling will hit in the coming weeks, if not days. So where do I look to buy into this fear? They’ve hit on a couple monster wells in the last quarter, validating all their acreage. They’re in Oklahoma, which enjoys some of the best oil prices in North America. 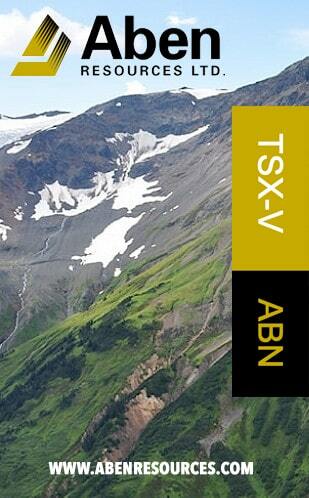 And Encana’s $5.5 billion buyout of Newfield tells me the industry loves this play. All these producers will have a reflex bounce up come January—just from the mindless selling pressure of tax loss time ending. There is a “gimme” of 20-30% coming in early January. But I think you have to be analytical to figure out where The Big Winners will be. 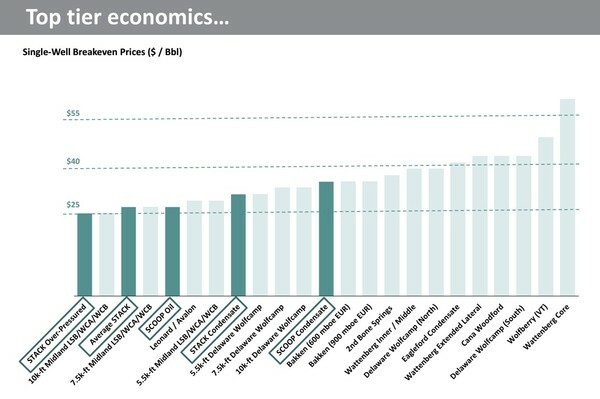 Pricing power has actually become A Big Deal for oil producers. Oklahoma is getting GREAT pricing, just $1.50/b off WTI. The Big Oil Plays in North America are suffering from severe price discounts. Permian producers got scorched early this year as the amount of oil being produced overwhelmed infrastructure and West Texas oil prices tumbled to first $8, then $12 and finally $20/b lower than WTI pricing. The Bakken in North Dakota had been enjoying a premium to WTI after the Dakota Access Pipeline went into service last year—but surging production there has already filled it and that premium has rapidly fallen to a $20/b discount on some days recently. One of the largest producing basins is the Canadian oil sands, and those barrels have had a $50/b discount some days. That’s really ugly. So I’m looking to invest where I can get the best bang for my buck—and that’s the U.S. midcontinent. Jericho got into the STACK play in textbook fashion—it spent 2015/2016 patiently buying assets for pennies on the dollar, a rare company armed with cash in a world full of desperate sellers. 2018 was the inflection point where Jericho Oil switched from asset accumulation mode to production growth mode. The early results for Jericho’s STACK wells have vastly exceeded management’s own lofty expectations. Jericho’s first well was the Wardroom 13-19N-13W #1H well, which was put on production early this summer. The well targeted the Meramec formation within the STACK and the results knocked the ball out of the park. This was a monster well. The Meramec well came on production at an eye-popping 950 boe/day. That was a top decile result for the entire basin and Jericho did it on their very first attempt. Today—after 230 days—the well has verified the quality of Jericho’s acreage. Jericho’s second well was the Swordspear 15-23N-10W location. This well targeted a second formation within the STACK which called the Osage. The Osage is quite different than the Meramec because it is a conventional reservoir. Conventional means lower rates of initial production, but also much lower decline rates. This is the kind of production that generates stable cash flows that most junior growth companies don’t have access to. Jericho’s Swordspear well came on at an excellent production rate of 500 boe/day. Since then production from the well has remained exceptionally strong. After 30 days the well was still doing 450 boe/day. Just yesterday they said the well has averaged 330 boepd after 160 days. Having the Osage as a low-decline, second formation provides the perfect complement to the big initial production rates of the Meramec. These 2018 drilling results from Jericho really couldn’t have been better. And while the results have been excellent they really aren’t all that surprising. Competitors including Alta Mesa, Chaparral, Devon, Continental, Newfield, Exxon Mobil and Staghorn have been drilling excellent wells all around Jericho. The economics of this acreage are equal to the best in the industry. Not surprisingly, leasing activity in the play has increased by 1,800% over last year. . .making STACK acreage more highly coveted. The industry wants this play badly. 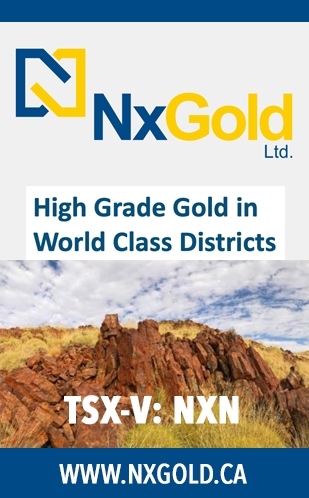 We don’t have to look any further than the $5.5 billion that Encana (ECA-NYSE/TSX) just agreed to pay for Newfield Exploration (NFX-NYSE) for proof of that. And now for 3. . .a land value underpinning the stock that’s worth 2-5x what the stock is trading for. This kind of valuation is really only relevant on a buyout, but it’s the kind of valuation that lets me sleep at night. Today Jericho and its partners are sitting on 16,000 net acres of highly coveted STACK acreage. On average, Jericho was able to acquire that land for $2,300 per acre. What is that land worth today? It isn’t hard to determine. 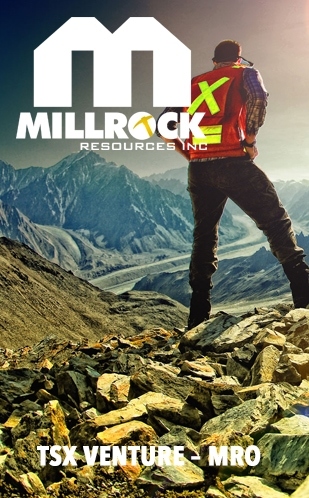 With companies now rapidly acquiring acreage all around Jericho we have a steady flow of documented arm’s length data points available to do such a calculation. 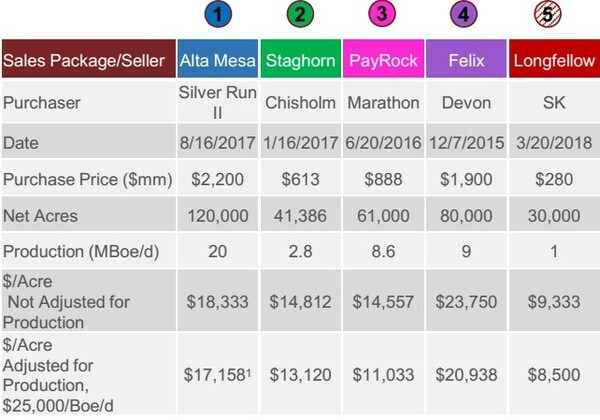 Adjusted for production, STACK acreage has been trading hands at prices ranging from $8,500 to $20,938 per acre. That is hard, verifiable, data. This provides us with a range of values, many of which were established when oil prices were much lower than today and when the play was much less proven. What these data points show us is that acreage today is worth 4 to 10 times what Jericho paid for it. Jericho’s “buy when there is blood in the streets” strategy has allowed the company to make multiples on their investment. That’s why I’m looking to increase my position in Jericho. To conclude, I would add a couple soft points. JCO has a smart, deep-pocketed and tightly held shareholder base. These shareholders include unusually heavy hitters like Ed Breen, the CEO of Dow DuPont. It is a shareholder group that screams of credibility and long-term thinking. These insiders own a full 46% of Jericho’s shares. These people all get paid one way. . .if Jericho’s share price goes up over the long term. All of this is a recipe for commodity development success. Buy good assets when commodity prices are low, then develop those assets and sell the production when commodity price rise. Keith Schaefer is editor and publisher of the Oil & Gas Investments Bulletin, which finds, researches and profiles growing oil and gas companies that Schaefer buys himself, so Bulletin subscribers know he has his own money on the line. He identifies oil and gas companies that have high or potentially high growth rates and that are covered by several research analysts. He has a degree in journalism and has worked for several Canadian dailies but has spent over 15 years assisting public resource companies in raising exploration and expansion capital. Want to read more about Oil & Gas – Exploration & Production? Sign up to receive the FREE Streetwise Reports’ newsletter. 1) Keith Schaefer disclosures are below. 2) The following companies mentioned in this article are billboard sponsors of Streetwise Reports: Jericho Oil. Click here for important disclosures about sponsor fees. An affiliate of Streetwise Reports is conducting a digital media marketing campaign for this article on behalf of Jericho Oil. Please click here for more information. 5) From time to time, Streetwise Reports LLC and its directors, officers, employees or members of their families, as well as persons interviewed for articles and interviews on the site, may have a long or short position in securities mentioned. Directors, officers, employees or members of their immediate families are prohibited from making purchases and/or sales of those securities in the open market or otherwise from the time of the interview or the decision to write an article until three business days after the publication of the interview or article. The foregoing prohibition does not apply to articles that in substance only restate previously published company releases. As of the date of this article, officers and/or employees of Streetwise Reports LLC (including members of their household) own securities of Jericho Oil, a company mentioned in this article. DISCLOSURE: I am long Jericho Oil. Management at Jericho Oil has reviewed and sponsored this story. The information in this newsletter does not constitute an offer to sell or a solicitation of an offer to buy any securities of a corporation or entity, including U.S. Traded Securities or U.S. Quoted Securities, in the United States or to U.S. Persons. Securities may not be offered or sold in the United States except in compliance with the registration requirements of the Securities Act and applicable U.S. state securities laws or pursuant to an exemption therefrom. Any public offering of securities in the United States may only be made by means of a prospectus containing detailed information about the corporation or entity and its management as well as financial statements. No securities regulatory authority in the United States has either approved or disapproved of the contents of any newsletter. Keith Schaefer is not registered with the United States Securities and Exchange Commission (the “SEC”): as a “broker-dealer” under the Exchange Act, as an “investment adviser” under the Investment Advisers Act of 1940, or in any other capacity. He is also not registered with any state securities commission or authority as a broker-dealer or investment advisor or in any other capacity. This entry was posted in Oil & Gas on December 5, 2018 by admin. TULSA, Okla. and VANCOUVER, British Columbia, Dec. 03, 2018 (GLOBE NEWSWIRE) — Jericho Oil Corporation (“Jericho”) (TSX-V: JCO; OTC PINK: JROOF) is pleased to provide an update regarding its ongoing participation in its Oklahoma STACK Joint Venture (“STACK JV”). The Swordspear 15-23N-10W #1H, the STACK JV’s first Osage formation well, has now been on production, since running an electrical submersible pump (capable of handling high fluid volumes), for 160 days and has produced, on average, 330 BOE per day (50% oil). The strength and, more importantly, the longevity of the Swordspear well’s production profile has given the Company great confidence in its northern STACK acreage position. Well positioned around significant activity from ExxonMobil and Alta Mesa Resources, the STACK JV’s northern STACK acreage, has pushed the boundary for where the Osage formation has been successfully proven with modern horizontal hydraulic stimulation. To achieve a strong well, it takes significant investment in actively drilling new wells in the same oil field, studying the geology where these wells exist and honing in on a repeatable completion technique. The Swordspear well, in addition to our non-operated positions in nearby peer wells, will provide a continual flow of data which will inform and improve our deep inventory of future multi-zone developments and the overall value of our coveted STACK resource. 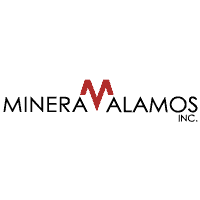 The Company’s 2018 development plan within the STACK continues to focus on defining and proving up its acreage position for the Meramec and Osage formations through horizontal drilling. Currently, the STACK JV now has an interest in four Osage formation wells and two Meramec formation wells. Jericho Oil (www.jerichooil.com) is focused on domestic, liquids-rich unconventional resource plays, located primarily in the Anadarko basin STACK Play of Oklahoma. Jericho’s primary business objective is driving long-term shareholder value through the growth of oil and gas production, cash flow and reserves. Jericho has assembled an interest in 55,000 net acres across Oklahoma, including an interest in ~16,000 net acres in the STACK Play. Jericho owns a 26.5% interest in STACK JV. Jericho’s current operations are focused on the oil-prone Meramec and Osage formations in the STACK. 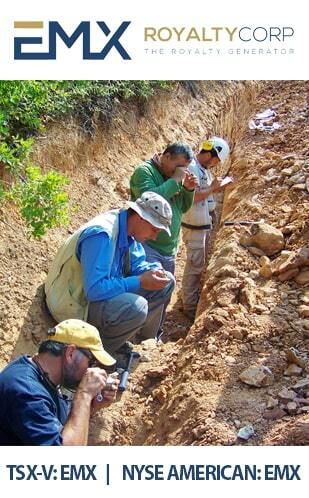 The Jericho team applies advanced engineering analyses and enhanced geological techniques to under-developed resource areas. Based in Vancouver, British Columbia, with operational headquarters in Tulsa, Oklahoma, Jericho trades publicly on the TSX-Venture (JCO) and OTC (JROOF). 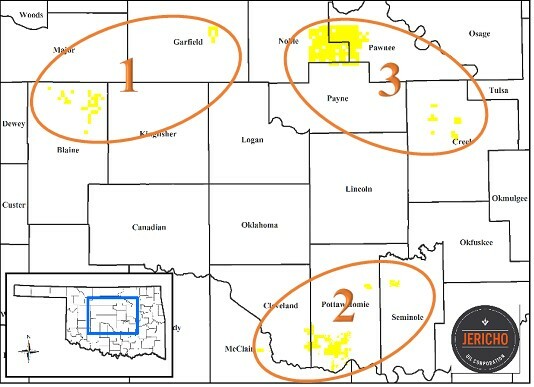 Jericho owns its net acre position in Oklahoma through, and participates in the STACK JV through, one or more wholly owned subsidiaries. Cautionary Note Regarding Forward-Looking Statements: This news release includes certain “forward-looking statements” within the meaning of the United States Private Securities Litigation Reform Act of 1995 and Canadian securities laws. There can be no assurance that such statements will prove to be accurate and actual results and future events could differ materially from those anticipated in such statements. 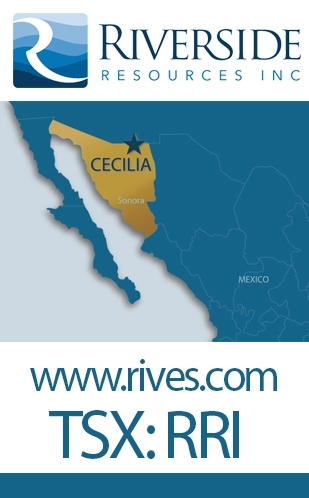 Important factors that could cause actual events and results to differ materially from Jericho’s expectations include risks related to the exploration stage of Jericho’s project; market fluctuations in prices for securities of exploration stage companies; and uncertainties about the availability of additional financing. This entry was posted in Oil & Gas on December 4, 2018 by admin. This entry was posted in Oil & Gas on November 30, 2018 by admin. To state that Oil has been through some tough sledding in recent sessions would be a colossal understatement. After recently hitting the skids for an unprecedented twelve consecutive sessions, this decline represents a rout never before witnessed. Looking at this chart, you’d think global demand had fallen off a cliff. Aside from Trump telegraphing warnings to OPEC not to cut production, there seems to be a perception out there that oil is fast becoming obsolete, that it’s going away, that the global shift toward a greater reliance on EV’s (electric vehicles) will render it a useless commodity overnight. Not true. Not by a highway mile. The Big Three automakers continue to crank out traditional gas-powered vehicles, producing more in a single day than Tesla will in an entire year. Global oil consumption could top 100 million barrels per day going into 2019. This next oil chart depicts the last five years of trading. The $50 level looks as if it could represent a fairly decent support zone. It’s also a big round number. The market often succumbs to these big round numbers as if by some powerful gravitational pull. My take of this support zone (horizontal line drawn in blue): a decent bounce from here, if not a bottom, could be in the cards short term. For sure, the rumblings coming out of the Whitehouse and OPEC will continue in the weeks and months to come. For sure, the volatility we’ve witnessed recently will have made its masterpiece by year-end (Bill Shakespeare voice). But this current situation could represent a rare opportunity to back up the truck on asset rich companies at deeply discounted prices. Jericho Oil Corp (JCO.V), a micro-cap in the oil space, is one of those rare company’s that had the foresight to stoke up its treasury while the going was good, before the market imploded several years back. With roughly $13M in the company coffers, it went looking for the right opportunity. That opportunity came along in the mid-continent of the US – Oklahoma. Today, the company boasts an enviable land position of some 55,000 acres, including 16,000 acres in the Anadarko basin STACK play of Oklahoma. According to the Fraser Institute’s list of the Most attractive jurisdictions for petroleum development, Oklahoma ranks number 2. If you are small – relative to the size of the true giants in the industry – you need to be focused. You need to appreciate the opportunity-set in front of you. And you need to know the marketplace you plan to execute in. By focusing on Oklahoma, they’ve completely mitigated the risk of any sudden systemic governmental shift that could take away their business. Local and state governments are more apt to move Heaven and Earth to see that wells get drilled, and assets get developed. Nearby communities are tied to oil production. They’re immersed in the culture and fully appreciate the many dividends oil production can generate. Jericho acquired their position in the STACK for an average of $2,300 per acre. Today, those acres are fetching better than $15k per. All of the these acquisitions have been drilled in the past. Jericho know there’s a significant resource there. They know the field is productive. They know the oil is extractable. The Breen Family Trust, with patriarch Ed Breen, former president of Motorola, ex-Chairman, CEO and liberator of Tyco International, current CEO DuPont… you get the idea. A prominent private oil family with Oklahoma roots, via a family trust. Their investment in Jericho speaks volumes. The Hegna Family via Steve and Mette Hegna. Make no doubt about it, this 10% plus club represents solid votes of confidence in Jericho’s underlying fundamentals. They represent long-term shareholders, smart money, and strong hands. Another benefit of engaging these strategic shareholders: No investment banks. No finders fees. With this management team, every penny is a prisoner. Named after the counties of Sooner, Trend, Anadarko, Canadian, and Kingfisher, the STACK has evolved into a premier North American horizontal development play. The acronym also represents the multiple, stacked productive formations present in the area:Chestermanning, Meramec, Osage, and Woodford. This a prolific hydrocarbon system. The STACK’s hallmark: high oil and liquids-rich natural gas content, multiple horizontal target horizons, extensive production history, and historically high drilling success rates. It’s important to understand that the area is dominated by a handful of large producers – Continental Resources, Devon Energy, Marathon Oil, Alta Mesa Resources, Newfield Exploration, and Chesapeake Energy. These companies have poured billions of dollars into developing their STACK assets. Jericho has positioned itself in the land of giants. The recent takeover involving Newfield’s assets pound home the intrinsic value here – the price producers are willing to pay for these STACK assets. The STACK is among the lowest cost basins on the entire continent. The region is flush with infrastructure. The area has good takeaway capacity – there are good pipes in the ground. 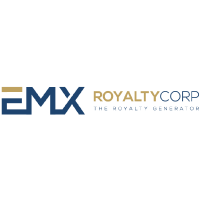 Good takeaway capacity means exacting the best possible price for extracted oil. Another factor driving investment in the region: your typical 1-mile horizontal well produces approximately 500,000 to 1,000,000 barrels of oil equivalent with rates of return greater than 75%. These are serious numbers. The pennies-on-the-dollar bargains Jericho scooped up in 2015 thru 2017 are not there today. As the market for acres shifted from dirt cheap to overpriced, so has the company’s focus. There have been no acquisitions since September of last year. 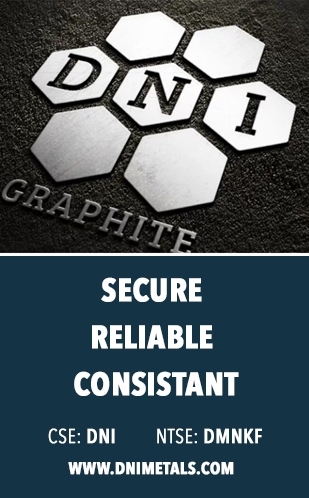 The company’s focus is now on development. And they have heaps of development runway. Developing a well is not an overnight process. From a scientific POV, a lot of thought and methodical planning need to go into it. Be that as it may, the company has two wells in the bag and two more coming on. Jericho holds a 47.5% Working Interest. Jericho holds a 48.0% Working Interest. Drilling ahead and building the curve from vertical to lateral section. Jericho holds a 23.5% Working Interest. The company also has a small working interest in two additional Osage formation wells, Ula and Hilltop, operated by ExxonMobil and Alta Mesa Resources respectively. Jericho’s participation in these wells is primarily to gain a greater understanding of the underlying subsurface geology. Drilling ahead in the lateral section – ~90% of the planned total measured depth. 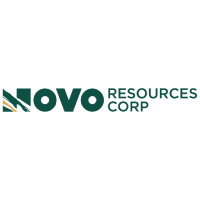 To date, the company has seen tremendous strides in the rate-of-penetration (“ROP”) on the Trebuchet relative to their first Osage formation well (the Swordpear) attributable primarily to an improved drilling-bit set-up and specific lateral geo-steering. The ROP in the lateral on the Trebuchet is approximately 1.6x-1.8x the Swordspear at the same measured depth putting downward pressure on total rig days for the well. 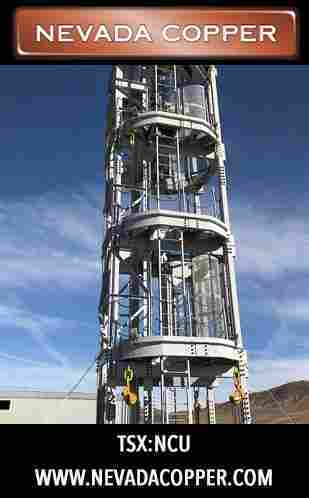 The fracture stimulation of the well is expected to begin in late-November / early December. 35 fracture stimulation stages successfully performed and currently in flowback. After only a few days on flowback, the company is extremely pleased with the resulting downhole pressures and total fluid flowback. 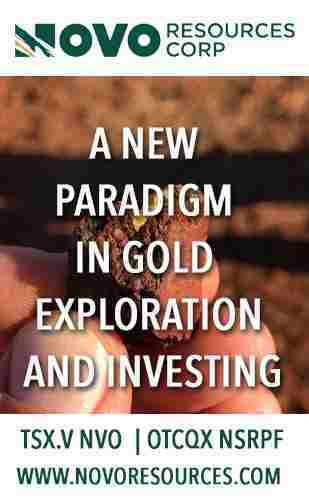 Though Jericho’s current focus is in de-risking and proving-up its 16,000 acres in the STACK, significant upside also exists within the company’s asset portfolio – some 40,000 acres – outside of the STACK. Their drill ready Osage Extension play in northeast Oklahoma is the only one example of a project with significant upside potential. 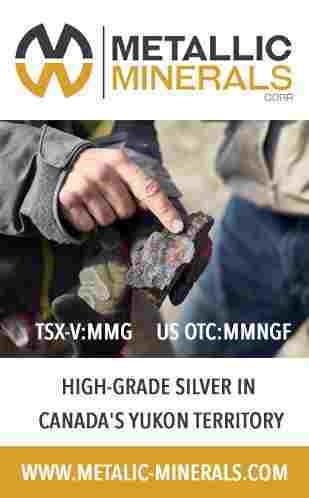 With 128.7 million shares outstanding and a sub-fifty cent share price, Jericho has an extremely modest market-cap of $61M. This price weakness is unlikely to last. The company could be on the verge of dramatic production growth. Newsflow should be strong going forward. Ultimately, Jericho’s goal, via a systematic and methodical approach to development, is to build a world-class blue-chip energy company. 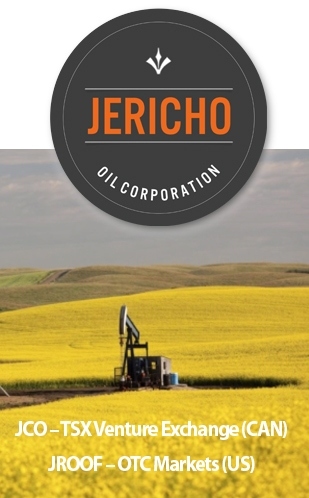 Full disclosure: Jericho Oil is an Equity Guru client. This entry was posted in Oil & Gas on November 26, 2018 by admin. 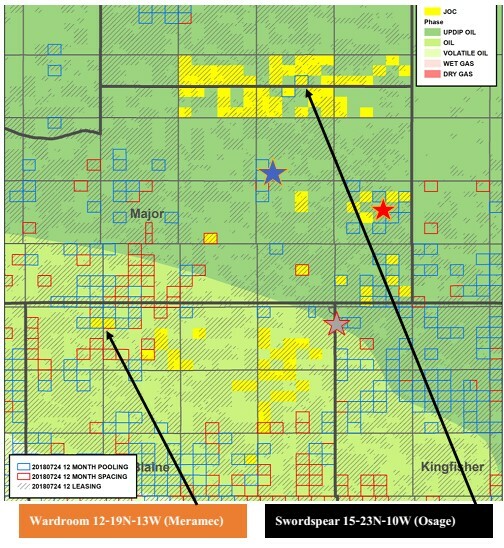 — To-date, we have seen tremendous strides in the rate-of-penetration (“ROP”) on the Trebuchet relative to our first Osage formation well (the Swordpear 15-23N-10W #1H) attributable primarily to an improved drilling-bit set-up and specific lateral geo-steering. 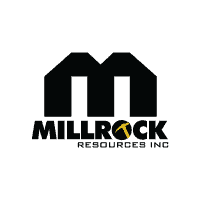 The STACK JV’s operations on its second Meramec formation well (the Valkyrie) on its western flank and a second Osage formation well (the Trebuchet) on its northern most STACK acreage is a continuation of the Company’s delineation plan for the STACK. Jericho also reports that it has retained Equity Guru Media Inc. for a 6-month editorial marketing contract. Chris Parry owns www.equity.guru and is a two-time Webster Award winning journalist who has been featured in the pages of The Vancouver Sun, The Province, National Post, Spin, Hollywood Reporter, FHM, Stuff, and Stockhouse. He was the first business journalist to identify and focus on the move to marijuana as an investment opportunity, and started Equity.Guru as a venue for honest, no punches pulled coverage of the North American public markets. The terms of the contract are for C$8,333.33 per month for 6 months of coverage commencing November 1, 2018. This entry was posted in Energy, Oil & Gas on November 12, 2018 by admin. I had the chance to sit down once again with Rick Rule, the president and CEO of Sprott U.S. Holdings, Inc. The topics of discussion covered what can often “go wrong” with general and administrative expenses, change of control provisions, changes in corporate strategy (referred to as “mission drift” in this context), and uniquely structured insider private placements. 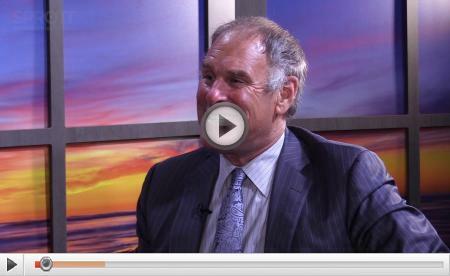 To watch the full video interview with Rick Rule, the president and CEO of Sprott U.S. Holdings, Inc. click here. Sprott U.S. Media, Inc. is a wholly owned subsidiary of Sprott Inc., which is a public company listed on the Toronto Stock Exchange and operates through its wholly-owned direct and indirect subsidiaries: Sprott Asset Management LP, an adviser registered with the Ontario Securities Commission; Sprott Private Wealth LP, an investment dealer and member of the Investment Industry Regulatory Organization of Canada; Sprott Global Resource Investments Ltd., a US full service broker-dealer and member FINRA/SIPC; Sprott Asset Management USA Inc., an SEC Registered Investment Advisor; and Resource Capital Investment Corp., also an SEC Registered Investment Advisor. 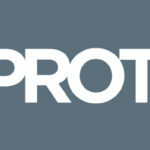 We refer to the above entities collectively as “Sprott”. The information contained herein does not constitute an offer or solicitation by anyone in any jurisdiction in which such an offer or solicitation is not authorized or to any person to whom it is unlawful to make such an offer or solicitation. This report contains forward-looking statements which reflect the current expectations of management regarding future growth, results of operations, performance and business prospects and opportunities. Wherever possible, words such as “may”, “would”, “could”, “will”, “anticipate”, “believe”, “plan”, “expect”, “intend”, “estimate”, and similar expressions have been used to identify these forward-looking statements. These statements reflect management’s current beliefs with respect to future events and are based on information currently available to management. Forward-looking statements involve significant known and unknown risks, uncertainties and assumptions. Many factors could cause actual results, performance or achievements to be materially different from any future results, performance or achievements that may be expressed or implied by such forward-looking statements. Should one or more of these risks or uncertainties materialize, or should assumptions underlying the forward-looking statements prove incorrect, actual results, performance or achievements could vary materially from those expressed or implied by the forward-looking statements contained in this document. These factors should be considered carefully and undue reliance should not be placed on these forward-looking statements. Although the forward-looking statements contained in this document are based upon what management currently believes to be reasonable assumptions, there is no assurance that actual results, performance or achievements will be consistent with these forward-looking statements. These forward-looking statements are made as of the date of this presentation and Sprott does not assume any obligation to update or revise. Views expressed regarding a particular company, security, industry or market sector should not be considered an indication of trading intent of any fund or account managed by Sprott. Any reference to a particular company is for illustrative purposes only and should not to be considered as investment advice or a recommendation to buy or sell nor should it be considered as an indication of how the portfolio of any fund or account managed by Sprott will be invested. Past performance does not guarantee future results. The views and opinions expressed herein are those of the author’s as of the date of this commentary, and are subject to change without notice. 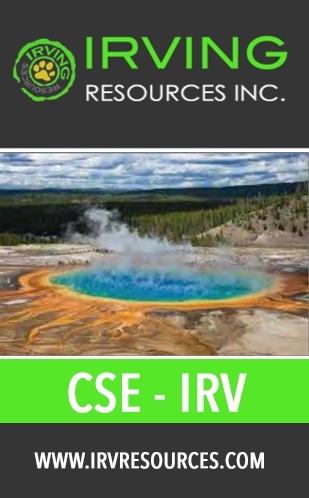 This information is for information purposes only and is not intended to be an offer or solicitation for the sale of any financial product or service or a recommendation or determination by Sprott Global Resource Investments Ltd. that any investment strategy is suitable for a specific investor. Investors should seek financial advice regarding the suitability of any investment strategy based on the objectives of the investor, financial situation, investment horizon, and their particular needs. This information is not intended to provide financial, tax, legal, accounting or other professional advice since such advice always requires consideration of individual circumstances. 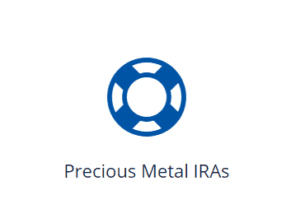 The products discussed herein are not insured by the FDIC or any other governmental agency, are subject to risks, including a possible loss of the principal amount invested. Generally, natural resources investments are more volatile on a daily basis and have higher headline risk than other sectors as they tend to be more sensitive to economic data, political and regulatory events as well as underlying commodity prices. Natural resource investments are influenced by the price of underlying commodities like oil, gas, metals, coal, etc. ; several of which trade on various exchanges and have price fluctuations based on short-term dynamics partly driven by demand/supply and also by investment flows. Natural resource investments tend to react more sensitively to global events and economic data than other sectors, whether it is a natural disaster like an earthquake, political upheaval in the Middle East or release of employment data in the U.S. Low priced securities can be very risky and may result in the loss of part or all of your investment. Because of significant volatility, large dealer spreads and very limited market liquidity, typically you will not be able to sell a low priced security immediately back to the dealer at the same price it sold the stock to you. In some cases, the stock may fall quickly in value. Investing in foreign markets may entail greater risks than those normally associated with domestic markets, such as political, currency, economic and market risks. You should carefully consider whether trading in low priced and international securities is suitable for you in light of your circumstances and financial resources. Past performance is no guarantee of future returns. Sprott Global, entities that it controls, family, friends, employees, associates, and others may hold positions in the securities it recommends to clients, and may sell the same at any time. 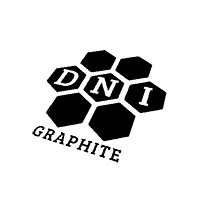 Copyright © 2018 Sprott US Media, All rights reserved. You are receiving this email because you requested information about the Sprott Group. 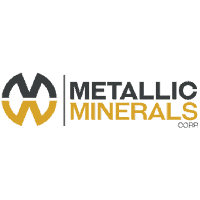 This entry was posted in Base Metals, Energy, Oil & Gas, Precious Metals, Project Generators on November 9, 2018 by admin. ROBERT KIYOSAKI | Why Invest In Oil ? Rich Dad , Robert T.Kiyosaki latest video about why we should invest commodities such as oil, gold, silver and other precious resources. Here in this video, Robert talks more on the reason why invest in oil as a long term financial success and how you can do it too in support with Rich Dad advisor , Tom Wheelright. Feel free to share the information worldwide and let them be educate by the financial education from Rich Dad. This entry was posted in Energy, Oil & Gas on November 6, 2018 by admin. Click here for the complete press release. 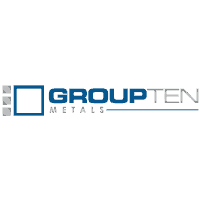 This entry was posted in Energy, Oil & Gas, Precious Metals on November 5, 2018 by admin. Copyright Proven and Probable 2019. All rights reserved.